Reg Presley passed away on February 4, 2013. Reg was an English singer and songwriter, best known as the lead singer for 19560’s band The Troggs. They has several hits back in the day, but the one he will be most remembered for will be “Wild Thing“. 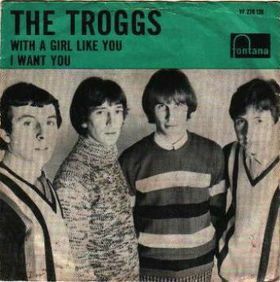 The band also had a major hit with “With A Girl Like You”. Both are linked below. He was also an author, writing “Wild Things They Don’t Tell Us”, a book about lost civilizations etc. Another piece of my youth has left us. And a bonus, the answer to who originally did Wet Wet Wet’s 1994 hit “Love Is All Around”. I enjoy travel, sports, music and anything else that jumps up at me for the moment, which is why I blog. There will be lots of music and travel posts and a smattering of sports and humour. I enjoy promoting Canada and am unabashedly a proud Canuck. Posted on April 27, 2013, in Baseball, Classic Rock, Music, Music History, Remembering, Song Of The Day and tagged Music, Reg Presley, Remembering, Song Of The Day, Troggs, Wild Thing. Bookmark the permalink. 10 Comments. Yes, Wild Thing…MY generation!!!!! Great song! I now associate it with the movie “Major League”. Kind of obliterated my earlier memories of it. …and hasn’t wild thing been used on commercials? Funny, I still drive around with “Love is all around” and “With a girl like you” on my CD’s. Both great songs. I think Wild Thing got over played – not my favorite. They had a good run though. Some timeless tunes there. How’s by you these days. I havent been around much in the past month or so. I’m fine. I’m still alive, so that’s good. Glad the sun is finally making an appearance. It helps my mood. Did here finally to. Snow is gone yahoo. Been to Winnipeg last weekend. Another reason why I haven’t been around. Lori’s 93 year old mom is terminal. She is there for the duration. I’m heading when I can. Summer is on the way though and we have some nebulous plans. Glad your mood is improving. I’m actually surprised any of the Trogs are still alive. Stuff like this is ancient history from teh very beginnings of rock. The basis on which all else is built.